It's been many months since I've done any AS3 programming and I must say that it feels good to get back into it. I've decided to implement the solitaire game Golf and then use that as the core experience around my corn dog manifesto. 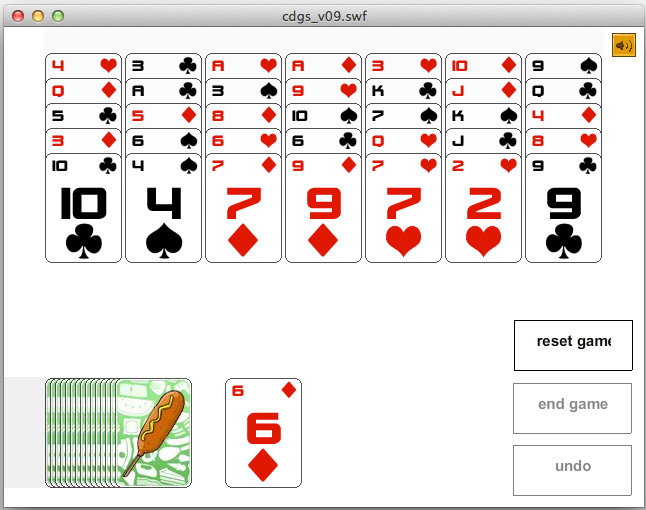 I have many plans for the game's not-solitaire-portions, like corn dog unlocks and whatnot. Getting it in this playable state: base game, undo the last card played and resetting the game properly has been quite a fun trek down programming lane. Can't wait to get cracking on the fun art side of things! It really does feel good to be back. It certainly has been a fun filled evening. In related news, my custom corn dog t-shirt has been shipped and is on the way. Photos to come. And yes, I created all the assets you see so far. That was a lot of custom poker cards to create.